The Bitter Southerner finds the best gas-station food in the Mississippi Delta. Liquor Store | Lula, Miss. I was in Lula, Miss., just across the railroad tracks from the liquor store on Main Street, when I ran out of gas. From afar, the shop seemed to hold promise — not for the spirits inside, but for the two steel structures in front, recognizable to any traveler on empty. Upon closer examination, however, it turned out that the pumps had long ago gone dry. In places like Lula, it seems booze has proven the more profitable stream. The older gentlemen loitering outside could not recall when the pumps last ran. The few commercial entities that appear in the Mississippi Delta, where the roads run long between isolated small towns, are commonly gas stations. Out of necessity, these places function more often like old-time general stores, where in addition to fuel pumps — or, increasingly, in place of fuel pumps — these establishments serve as small restaurants, take-out eateries and grocery stores for communities otherwise without. Rural counties in the Mississippi Delta average one grocery per 190 square miles — a statistic that often leads scholars and politicians to call out the region when defining food deserts: low-income areas without access to a traditional grocery store within one mile of home. While many residents of the Delta make long journeys to big supermarkets on occasion, gas stations pinch hit as the go-to food purveyors in town. And contrary to popular narratives, that doesn’t always equate to Hot Cheetos and Mountain Dew. Nixon Maddox (pictured in red apron) owns Maddox Grocery in Avon, Miss. His boudin draws crowds. 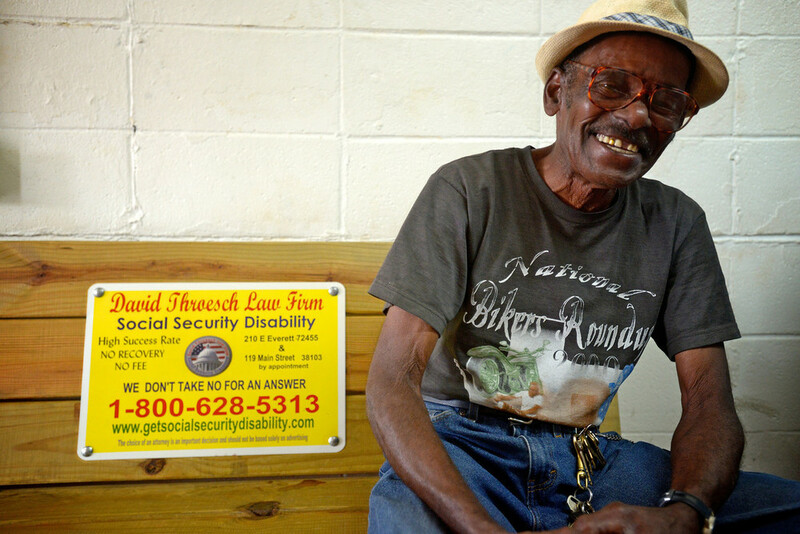 Fratesi’s Service Station near Leland, Miss., is one such place. It has been a fixture off Highway 82 since 1941. Alongside the requisite snack foods, fresh bait, ammunition, and coolers of beer, owner Mark Fratesi presides over a deli case that pays homage to his grandparents’ Italian roots, with the likes of prosciutto, Bolpi salami, hog head souse and freshly ground Italian sausages. “Most gas stations don’t hang deer heads on the wall. I guess you could say we do things a little differently around here,” Fratesi says. Farmers drop in at lunchtime for fried-olive po’ boys and housemade gumbo, then circle back around 5 p.m., when the seating area transforms into the “East Leland Country Club,” featuring a bounty of Budweiser and tall tales. While his father allowed happy hour to extend until 10 p.m., the younger Fratesi shuts it down at 7 p.m. sharp. Beers are consumed on the honor system. As night nears, customers report their tallies in an in-house charge ledger. Fratesi Brothers Grocery, aka the East Leland Country Club, where you record how many beers you've had — honor system — in the ledger. Right, Betty's Place | Indianola, Miss. People outside of the South marvel at the idea of gas-station food. But we Southerners come up knowing that some of the greatest culinary gems are tucked into the backs of service stations. Walk beyond a BP’s myriad potato chips and candy bars and discover a hot bar bubbling with the only Indian food in town, made by the proprietor’s wife and giving new life to passed-down family recipes. Or you might find fried apple pies at the register of the Citgo, alongside the clerk’s aunt’s pound cake, neatly Saran-wrapped by the slice. If truly lucky, there will be hot tamales — not the candy, but the variety shrouded in corn husks. Hot tamale remnants: Only the husks remain. Meal enjoyed at Delta Fast Food, Cleveland, Miss. The sign outside Delta Fast Food in Cleveland, Miss., touts a “convenient store.” While they no longer pump gas, owner Gentle Rainey continues to serve up some of the region’s best hot tamales. Rainey learned the Mississippi tamale tradition from his grandfather, Sylvester Blaylock, who first made tamales as a side job at nearby Dockery Plantation, using corn husks from the field. Generally made of cornmeal-shrouded beef or turkey, the tamales at Delta Fast Food are known to be spicier than most in the region. Contrary to what the store’s name implies, Delta Fast Food — much like Fratesi’s Service Station — functions as an informal community center during the average day’s in-between times. Children flood the place when school lets out, counting pocket change for a bag of Hot Fries and a Gatorade. With the tenderness one would hope for from a man named Gentle, Rainey calls out to each child by name. Then, as the afternoon progresses, the clientele gets older; people sit around with brown-bagged Budweisers, the stereo gets louder, and competition heats up at the pool table in the back. Other nearby operations have adjusted their business model to service both a hungry crowd and those needing fuel. Spend one day traveling the two-lane highways of the Mississippi Delta and you will undoubtedly come upon one of some 50 Double Quick stores scattered throughout the region. With nearly a century under their belt in the petroleum business, the Gresham family, owners of the Double Quick chain, have learned to accommodate the near-constant fluctuation in gas prices by operating these shops as full-fledged restaurants and occasional grocery stores. “We tend to think of ourselves as a food destination first, that just happens to sell fuel,” says Damon Crawford, director of marketing for Double Quick. Customers in search of fried chicken tend to agree. The Double Quick with the best fried chicken | Main Street, Greenwood, Miss. Because the markup on gas today is so tight, Mark Fratesi has in recent years adopted a similar mindset. “I make more off selling a can of Coca-Cola than I will off a gallon of gas,” Fratesi says. Though the upfront investment to install and maintain fuel pumps demands a lot of capital, an independent gas station such as Fratesi’s can make only about a dime off each gallon sold. 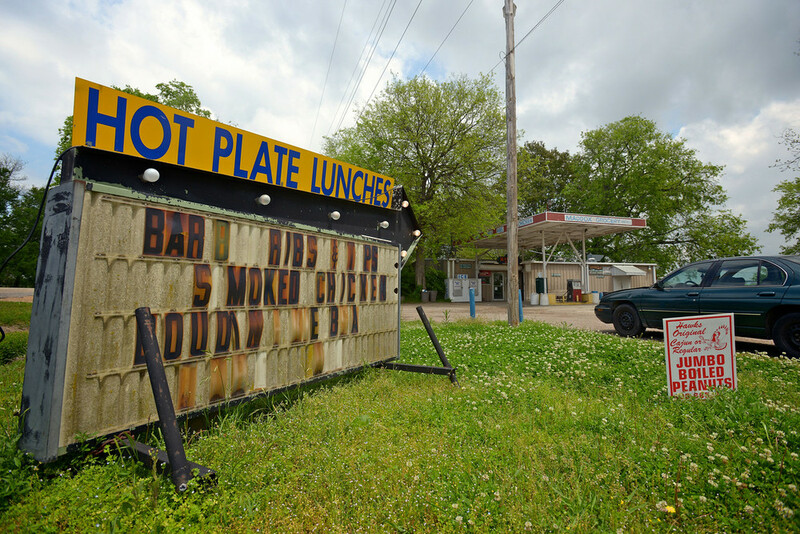 For this reason, chain fuel operations continue to turn their attention to Delta towns of some size, such as Cleveland (population 12,000), for their neon-signed outposts along the highway. In towns of smaller size, such as Alligator (population 200), gas-station owners must get resourceful. James Bryant took a long look at the ledgers of his shop, the Bryant Express, which sits at Alligator’s busiest intersection, and eventually decided to rip out the pumps and bet his haul on wing plates, rib tips and fried catfish. “We see some 300 people through here for dinner on a Friday or Saturday night,” Bryant says. Fried Moon Pie, BMW Pit Stop | Moon Lake, Miss. When I ran out of gas at the liquor store in Lula, I was in the midst of chasing down a tip about a particular gas station’s fried Moon Pies, courtesy of a second cousin who lives nearby. A gracious traveling salesman offered me a lift out to Jordan’s Kwik Stop on the main highway, and the proprietors of this station helped me fashion a makeshift gasoline canister and then guided me the extra 10 miles over to my Moon Pie destination at Moon Lake. In 2011, when Kevin Martin took over Moon Lake’s BMW Pit Stop (so named for previous owners “Bobby and Mary Wolfe”), he decided to refill the gas pumps, redesign the menu, and reappropriate the acronym (now “Bite My Worm”). BMW Pit Stop | Moon Lake, Miss. At the cash register, where one traditionally finds rows of impulse-buy Trident, there are instead novels on the shelves, where Martin has fashioned a makeshift lending library. Pick one up. Leave one behind. Come back for another. The middle of the store offers opportunities to pluck basic hardware from the shelves, a bottle of Robitussin, some last-minute insect repellant. A customer watches television. 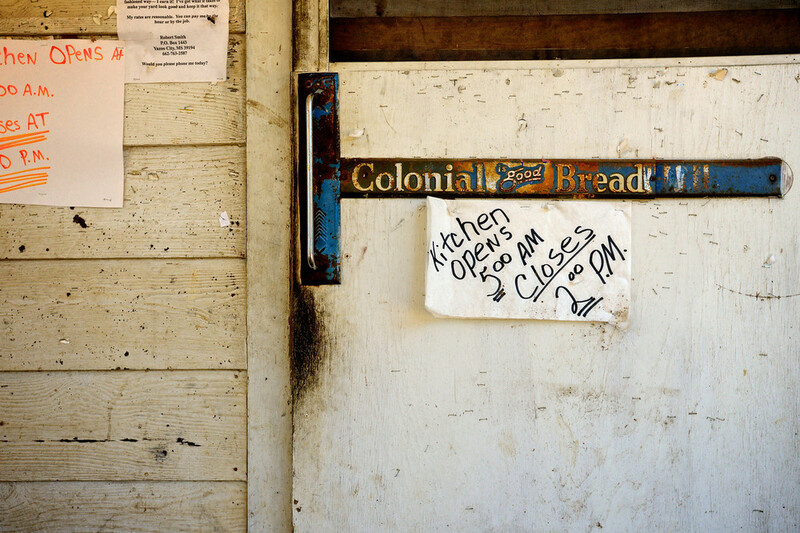 Martin mans the kitchen in back, serving plate lunches replete with tomatoes, turnip greens, okra and other vegetables, all grown at nearby farms. But it’s the Bisquick-breaded and nutmeg-laced fried Moon Pie that serves as Martin’s secret weapon, piquing a traveler’s curiosity enough to detour off the main drag for this ice cream-topped creation. Satartia Grocery | Satartia, Miss. The BMW Pitstop is just one of dozens such places around the Delta and the rural South where communities flourish inside the most mundane of place — the filling station.